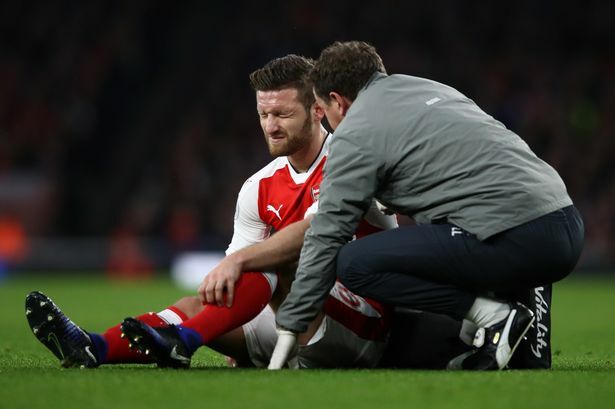 Shkodran Mustafi has given a positive update on an injury he sustained while playing for Arsenal against Stoke City on Saturday. The German defender limped off the 3-1 win with a hamstring strain just twenty-four minutes into the first half to be replaced by Hector Bellerin. Arsene Wenger after that game said that the 24-year-old will be out for at least three weeks, a news that has brought cold to the nerves of some fans. Mustafi has however come out via his official Twitter account to assure us of a speedy return in no time. He tweeted: "Very bitter injury at that point of the season. I'll do everything I can to recover quickly and come back stronger than before #sm20"
With Per Mertesacker still out, Gabriel Paulista will have to deputize for Mustafi while he is away in the treatment room. We hope he returns stronger for us.